Three students of Maastricht University (including a FASoS student) got inspired by two girls from Maastricht, who were on strike all day on 7 February at the town hall. 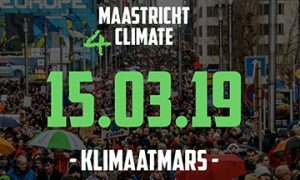 The students would like to support them by organising the first Maastricht Climate March. We are very proud that our community is so dedicated to our planet’s future. That is why we support the Maastricht Climate March on Friday 15 March, organised by Students 4 Climate. Our students and staff that would to participate are free to join the march. We call on to our departments to allow for students and staff to join the march and inform each other about it in time. NB on this date the WOinactie action also takes place in The Hague.